MK Yogev calls to separate between Gaza population and Hamas leadership with Egyptian and other help to strengthen deterrence. 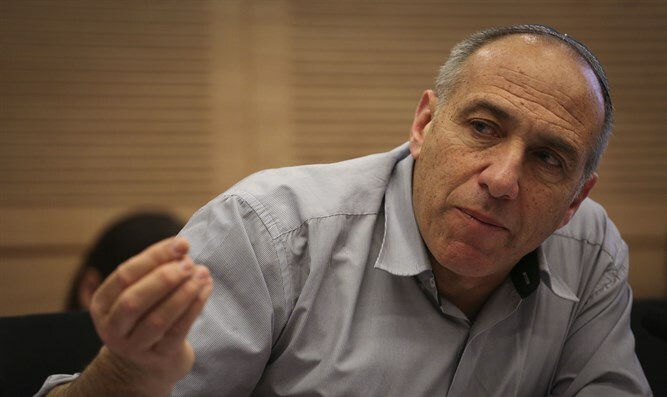 Knesset Foreign Affairs and Defense Committee member MK Moti Yogev (Jewish Home) said stronger deterrence is achievable by an attack on Hamas leaders without harming the civilian population. "The Palestinian Authority and Abu Mazen are irrelevant to the solution and to the arrangement in the Gaza Strip," says Yogev, adding that "Abbas doesn't care about Gaza's residents just as Arafat didn't care. Hamas isn't the solution either. It temporarily controls Gaza and if there's no national consensus on the need to defeat the Hamas regime, then we have to try and get along with them temporarily, while strengthening deterrence by hitting its heads, not closing the crossings and harming the population." Yogev says, "In the Gaza Strip, we must act to differentiate between the population and the Hamas regime, strengthening deterrence by harming Hamas leaders, not harming the population by closing the crossings. We need to help by providing humanitarian assistance to the population in Gaza, including approving work in Israel. In this regard, any international partnership of Egypt or money from Qatar to benefit the population will be welcomed." Yogev adds "at the end of the day, sooner or later, we won't be able to escape responsibility for Gaza, we'll have to defeat Hamas and every other terrorist organization and control the Gaza Strip with over-encompassing security and humanitarian control over the Gaza Strip. This is also because Gaza is part of the Land of Israel, both for our security and for the benefit of the residents of the Gaza Strip, and also for the return of our missing persons. Any other illusion from the school of Oslo and the disengagement is unrealistic and irresponsible over time."